It’s entirely fate that Ryan and I get one day off a week together. Neither of us have set days off and unless it’s something important we never ask for days off to match but last week we both had Friday off so we decided to spend the day doing something other than chilling on the sofa, watching films and cleaning the flat. 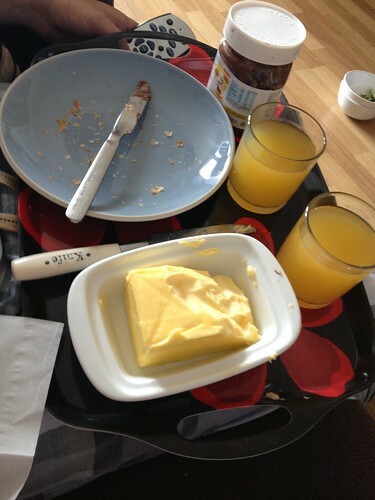 The remains of our croissants and juice for breakfast. We’re not normally breakfast people but this was a nice change. Then off we went to visit The Royal William Yard to check out if there were any decent places to have an nice evening meal with Ryan’s family after his graduation. Ryan took me down the ‘scenic’ route and I wish I’d stopped to take pictures because there were some really awesome abandoned buildings, one even had a tree growing inside it and the curtains were still there! And some of the other buildings were done up and made so pretty. But alas I completely forgot to take pictures. It was a really nice walk, I even enjoyed the almost consistent drizzle the whole time we were out. It definitely made for some lovely pictures. Now if only my camera skills were a bit more artistic! We definitely found some nice places to eat so we might be popping down again, but after that long walk we ended up popping into Nando’s for some chicken. Seriously love me some chicken especially in lemon and herb sauce.The moral of this. Make more effort to leave the flat on days off together. « Plymouth We Love You!